Sadie Belle Alloway, daughter of Townsend Alloway and Rebecca Jane Afford, was born Mar. 11, 1879 in Ringgold Co.,Iowa and died Mar. 27, 1922 in St. Joseph, Buchanan Co., Missouri. 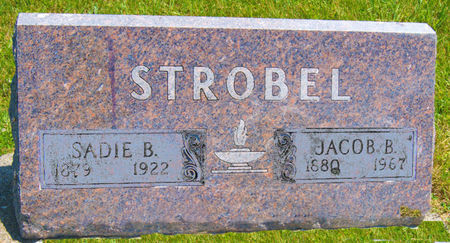 She married Jacob B. Strobel Feb. 14, 1905 in Ringgold Co., Iowa. He was born Nov. 26, 1880 in Wittenberg, Germany, son of Henry Strobel and Ursula Schock, and died May 1967 in Bloomfield, Davis Co., Iowa. Searching for SARAH BELLE "SADIE" ALLOWAY STROBEL in Taylor County Iowa?